Improve the sound and performance on your 2015-19 Dodge Challenger 6.2L and 6.4L Hemi with our Redline 3" Catback exhaust with X-Pipe. 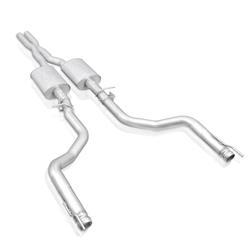 This system includes tailpipes and adapters to fit to factory manifold lead-pipes or Stainless Works headers. These dual custom turbo mufflers, engineered for a drone free aggressive sound, are tuned specifically for this Hemi engine from Dodge. This system includes functional 3" diameter Active Exhaust replacement valves in the tailpipes, utilizes factory OEM tips, and includes clamps and hangers. Our Redline series is designed to get the most aggressive sound out of your ride. We design Redline systems to maximize the volume and tone of the engine, while still eliminating any drone in the cabin. Resulting in a feeling that will make you want to high-five your friends in the face. This system is built from corrosion resistant 304 stainless steel and TIG welded at our state of the art facility in Streetsboro, Ohio. As always, we stand by our products with a lifetime warranty on material and craftsmanship.